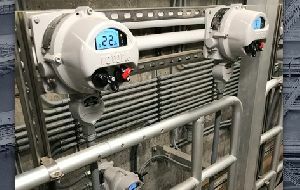 Recent rehabilitation at the drinking Water Treatment Plant #2 in Olathe, Kansas, USA, has included the installation of Rotork IQ3 intelligent electric valve actuators to replace electric actuators from another manufacturer. In the gravity filter plant, 18 butterfly valves are situated in an area beneath a walkway which made it difficult to access and operate the old actuators. With the new Rotork actuators, the installation of Remote Hand Stations (RHS) has now eliminated this problem. Providing an exact duplicate of the actuator switches, display window and control interface, the RHS are mounted on the walkway to enable the user to conveniently and safely operate, interrogate and configure the actuators below. Power for each RHS is supplied by the actuator, with which the unit shares all the benefits of the same O-ring sealed IP68 double-sealed environmental enclosure. Standard comms wiring suitable for the operating environment is all that is required between the actuator and the RHS, which can be installed at a distance of up to 100 metres (328 ft) from the valve. Unlike alternative options offering only basic operation and indication, the RHS retains all of the actuator’s functionality, presenting an identical window into the process, showing diagnostic data including the valve torque and usage profiles. Using the Rotork hand-held setting tool with its secure wireless Bluetooth® link, this information can be downloaded and transferred to a PC for analysis using Rotork Insight2 diagnostic software to fulfil asset management requirements. Find out more about the Remote Hand Station.